Built space is both a physical entity as well as a socially and historically constructed place. It constantly interacts with human beings, affecting their behavior, thinking, and feeling. Doing religious work in a particular environment implies acknowledging the surroundings to be integral to theology itself. The contributors to this volume view buildings, scriptures, conversations, prayers, preaching, artifacts, music and drama, and built and natural surroundings as contributors to a contextual theology. The view of the environment in which religion is practiced as integrated with theology represents not just a new theme but also a necessity if one is to understand religion's own depth. Reflections about space and place and how they reflect and affect religious experience provide a challenge and an urgent necessity for theology. This is particularly important if religious practitioners are to become aware of how theology is given expression in the existential spatiality of life. Can space set theology free? This is a challenging question, one that the editor hopes can be answered, at least in part, in this volume. The diversity of theoretical concepts in aesthetics, cultural theory, and architecture are not regarded as a problem to be solved by constructing one overarching dominant theory. Instead, this diversity is viewed in terms of its positive potential to inspire discourse about theology and aesthetics. In this discourse, theology does not need to become fully dependent on one or another theory, but should always clearly present its criteria for choosing this or that theoretical framework. 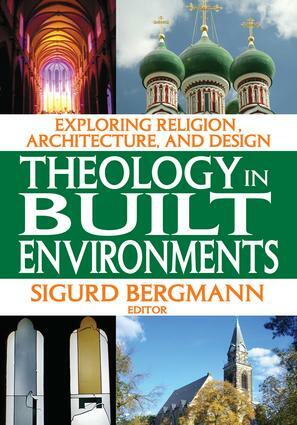 This volume shows clearly how different modes of design in sacred spaces capture a sense of the religious.